Right. Like you need another expert on the Internet telling you what to do. Well, I'm not going to do that. These are some broad, general topics based on what I see in a lot of pictures. Learn how to use your camera. I'm actually serious about that. Even the most basic of today's digital cameras can do more than what even the most advanced cameras of 20 years ago were capable of. (Computers versus black magic analog-mechanical voodoory...) Real-time previews, hundreds of exposures per memory card, automatic white balance, plus hosts of other features. Figure out how to manipulate the EV. One of the most important settings you should figure out how to manipulate, is how to adjust your Exposure Value (EV). If the part of the image you really want is in the shadows, and a light source is throwing off the exposure (for instance, a streetlight) you can fix the problem to a certain extent by adjusting the EV up or down. Since what you see on the preview screen is the image you're going to capture, make full use of being able to adjust the light levels. Along the same lines, remember to use the ND (Neutral Density) filter on very bright days or in bright environments, like at the beach and on sand. It's the equivalent of putting on sunglasses, but doesn't affect or introduce any color. You really need a tripod. (You can read all about what I use in Imaging.) In crowded areas (like in theme parks), and you should be aware of where your tripod legs are. They don't have to be fully swung out. If you can keep the tripod legs spread to the width of your body, and keeping it close, you'll minimize a disaster between your tripod and fellow guest. You can also use a monopod, but a monopod doesn't replace a tripod in the photography world. For starters, unless you can plant the monopod into the ground, you'll have to brace it against something. You can still move in every direction except up and down, and those 1/2 to 1 second exposures will come out blurry. The camera mount on a monopod usually doesn't tilt, so you have to get a tiltable head if you want the camera level as you brace the monopod against something. On the other hand (yes, I have three hands), I have successfully used hand rails, garbage cans, rock ledges, even putting the camera on the ground for long exposures. I must add that a good optical stabilization is amazing for what it does. I've had successful handheld shot up to 1/4 second. Even with a rest or tripod of some sort, you don't want to press the shutter button for long exposures. As Charles Bronson said in The Magnificent Seven, "Squeeze, don't push." (Okay, so it's not an exact quote.) On a lightweight tripod, even this isn't enough. Previous to my G7, I would have used the infra-red remote control that came with the camera. Canon cheaped out and discontinued that feature. So now, I set a shutter delay of 2 seconds, press the shutter release and let go. By the time two seconds have passed, any shake has stopped, and have gotten some pretty good results. Okay, it's mostly everything. Sometimes, it's about capturing a moment, and moments can be fleeting. Learn how to frame a shot quickly. By the time you turn the camera on, play with the zoom and take the picture, the moment could be gone. On the other hand, it might be worth waiting for clouds to move (in or out of frame), or witnessing the entire sunset over the mountains for interesting lighting changes. Learn to use the entire frame. There's nothing more boring than someone's face in the middle of a picture with nothing in the background. (Unless you're specifically taking portraits or at family gatherings, which are by definition... Well, never mind.) They remind me of mug shots, only sometimes the people are smiling. Don't just look through the viewfinder or preview screen, but look at the real world itself to see what should (and sometimes shouldn't) be in frame. You should also decide what the subject of the photo is. There might be more than one. If there is, you should give both equal weight, by making sure one isn't blocking the other. For instance, if you're at Mount Rushmore, do you really want your wife/husband/friend/whatever blocking out Jefferson and TR with Washington and Lincoln coming out of his ears? Well, maybe you do. But if that's not your aim, put the person off to the side or below. There are many times I'll actually want someone in the frame to give a sense of scale. Much of this can be applied to any crowed place, but I'm talking about theme parks in general. One of the biggest problem at most theme parks, other than the other guests, is how close everything is. The "streets" are really quite narrow, and generally you'll want a wide angle more than a telephoto. My G1X has a 28-112mm (35mm equiv) telephoto, and found I appreciate the wide-angle more than the dislike the lack of telephoto. You should also be aware that the consequences of shooting wide means you might have to spend more time in post-processing correcting for perspective and barrel distortion in close quarter shooting of vertical lines, like buildings. Be very careful about using tripods at night, since theme park guests aren't very observant about where they're going in the first place, especially children. Having someone knock over your camera and trip and fall at the same time won't be a good time for anyone. 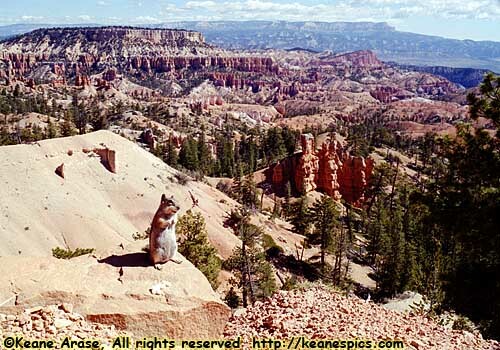 The National Park venues in the West are different from the ones in the East. Most of those in the East were created to preserve United States history. The minority are the geologic parks, the ones that preserve and protect an environment. (Great Smoky Mountain, Congaree Swamp, etc.) But most of the park venues can be shot with a wide to moderate zoom. The opposite seems to be true in the West. There are a lot of historical sites, but it's the huge expanse of the big Western Parks that has a lot of the draw for me, and millions of other tourists. Glacier, Grand Teton/Yellowstone, Yosemite, Rocky Mountain, they're all larger than you think. I'm not sure you can get away without having some sort of strong zoom range on a camera. In other words, a camera with a fixed prime lens will work, but it will limit your ability to capture the parks. As big as a mountain is, the big National Parks are enormous and can dwarf a mountain range. My 35mm range of 35mm to 210mm worked well. If you shoot a lot of wildlife, a longer lens might be desirable, but handholding such a lens becomes problematic. You will probably need a sturdy tripod as standard equipment. 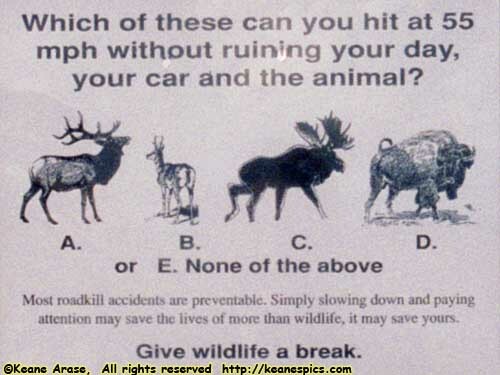 A poster in Grand Teton National Park. Don't be stupid. Mother Nature will kill without a second thought, without remorse, and show no sympathy after it's done. Wet rocks are slippery, and falling into a river trying to get that shot (or posing your friends and family) and going over a 500 foot waterfall isn't unknown. Google it. Simply tripping or slipping next to a 1000 foot cliff won't end well for you or your camera. So before you even consider taking a shot, make sure you're in a safe position to do so. Wildlife as a general rule (and I may or may not include people here) should be considered dangerous. Some are accustomed to people, but that doesn't mean you can go up to one and pet it. I've gotten some great shots of a lot of wildlife, but always from a safe spot, mostly inside the car. Finally, pay attention to your driving. You can't video tape and gawk and possibly have your full attention on the road.